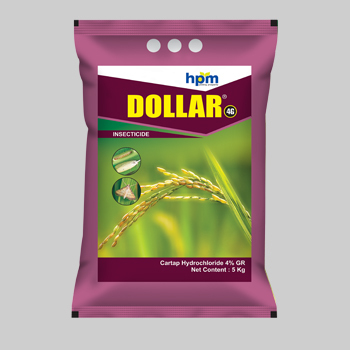 Dollar is a unique potent insecticide formulated as granules for easy broadcasting in paddy fields. It has both stomach and systemic properties. Developed foe use against Oragano phosphorus and organo chlorine resistant species of insects. Due to its systemic action, Dollar is effective against a wide range of paddy pests such as stem borers, leaf folders, whorl maggot and leafhoppers. Insects discontinue feeding upon ingestion of Dollar resulting in starvation. Dollar may also be used to control Shoot Borer of sugarcane, Diamond back moth of cabbage and cauliflower, fruit borer of brinjal, pest of chillies . Non-Systemic insecticide and acaricide with contact and stomach action. Exhibits a translaminar effect.Has ovicidal properties.